The effect of a one-degree error in the azimuth angle for a latitude tilt system is similar throughout the year. The first figure below shows the POA irradiance error pattern on the summer solstice. At other times of the year the pattern is similar except for the changes in the length of the day. This pattern is symmetric for irradiance, with lower irradiance in the morning and higher irradiance in the afternoon when the array is one degree to the west. However, the effect on PV performance will be affected by the fact that air temperature usually rises throughout the day. The combination of these effects is site- and weather-dependent, and thus complex. Irradiance effect of 1 degree error in azimuth angle for a latitude tilt PV system in Albuquerque, NM at the summer solstice. 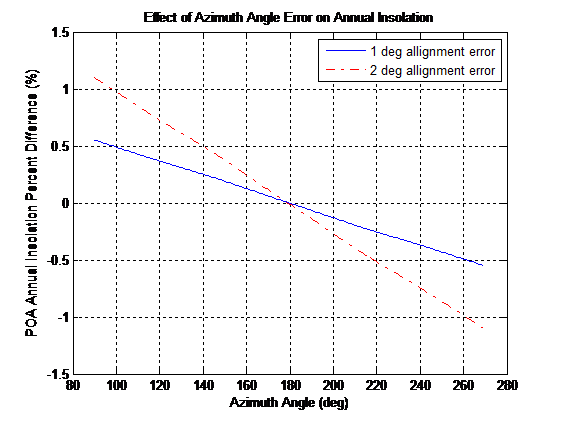 The annual effect of a one degree error in azimuth angle changes with the azimuth angle, but not as much as for the tilt angle. Also, it is important to note that the effect of the alignment error is greatest as the system is pointed away from due south. 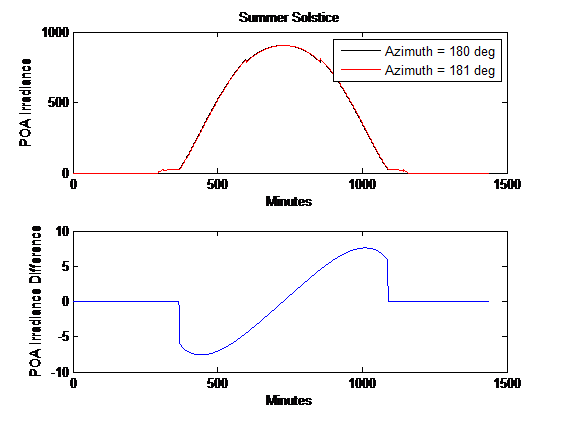 Insolation effect of a one degree error in azimuth angle as a function of the azimuth angle.